Opening up an ice cream store? 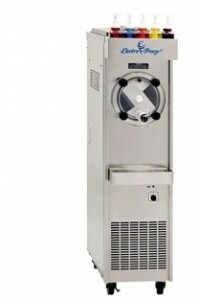 High Capacity Floor Model Slush/Cocktail Freezer: fast, easy, controlled, and labor saving slush! This floor-model frozen beverage freezer is designed to serve high quality fast, easy, portion-controlled, labor-saving slush and smoothies. Syrup racking with 5 bottles provides flavor options while running a neutral or core base flavor. Great for youth baseball venues, ice cream stores, fun parks and more.